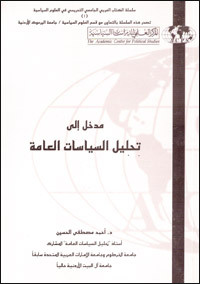 Issued Scientific Center for Political Studies of the series in collaboration with the Department of Political Science at Yarmouk University in Jordan. Saw the field of public policy, like that of other social fields, a tremendous development in the last two decades of the last century. Despite this development, this massive field did not find a great interest in the Arab and Islamic states something that was reflected in the lack of ads Beate Arabic, and the adoption of most Arab universities in teaching the foreign references, and the American ones in particular. Hence the urgent need for this book. Represents this book Add distinct and authentic Arabic library in general, and for the student researcher and especially Arab, which provides background material for students of political science and public administration at the level of university studies. The book has taken care to explain the general framework and theoretical analysis to the issue of public policy. This included a definition of terms and concepts of policy analysis and field workers do. It also dealt with the characteristics of public policy, in addition to discussing the evolution of this field, and locate it in the map of the social sciences. The definition of modern developments and the different currents for this field. This book also dealt with the currents and the entrances or the study of theories and public policy analysis and analysis tools. Including entrances political and economic entrances and driveways of professional art. And its relationship to the role of states, as well as its role in policy formulation. In addition to its relationship with the policies of political and administrative reform and globalization. This section also touched briefly to the theories of development and its relationship to development policies. And ended the door to make proposals on how to use the entrances and analysis tools. This book has also studied public policy-making institutions and processes. Eating policy-making institutions of formal and informal. It also dealt with the preparation, implementation and evaluation of public policies. Finally, the book dealt with the subject of the establishment of a field of policy analysis in the Arab countries, and focused on proposals for the establishment of the field. To achieve this purpose, the book focused on the importance of the establishment of the field in the Arab countries within the framework of my values ​​stems from the circumstances and the Arab and Islamic culture. It also focused on the role of scientific research in the establishment of the field in the Arab and Islamic countries. The finished book is to provide a general framework to guide the process contributes to scientific research and the study of this field. Has opened new horizons for Arab scholar and student.